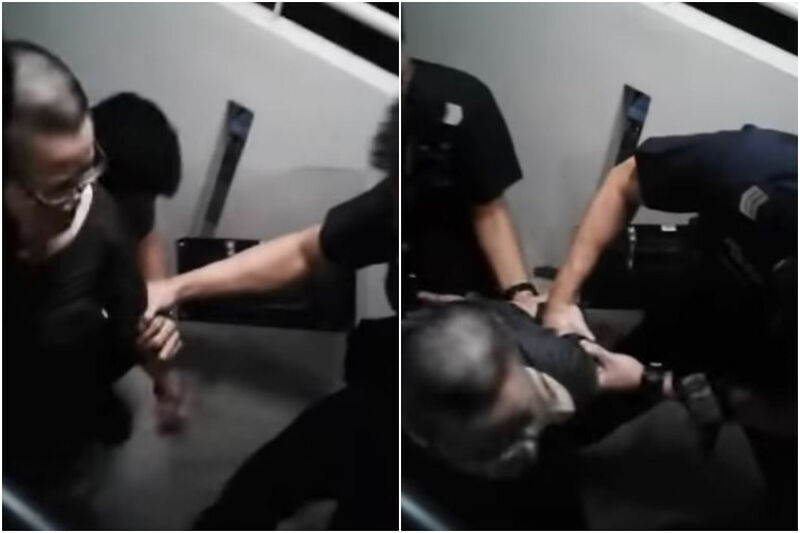 SINGAPORE - A 61-year-old woman who was filmed attacking an apartment with a chopper and who subsequently got tasered was arrested on Christmas morning (Dec 25). The police said on Wednesday that the woman had gone to her neighbour's unit at Block 157 Serangoon North Avenue 1 to complain about the noise level, after which the neighbour called the police. Upon the police's arrival, the woman was seen hitting the gate and windows of the neighbour's unit with a chopper at about 4am on Tuesday. The police officers instructed her several times to drop the chopper but she refused, after which a police officer used a Taser on her. Said a police spokesman: "A police officer eventually deployed one cycle of Taser on the woman as she continued to act violently and refused to cooperate, endangering her personal safety and that of others." After getting tasered, police said the chopper dropped from the woman's hand as she fell to the ground, but she was still able to stand up immediately and continued to resist arrest. The police said the officers did not taser her again due to her age and the fact that she was no longer armed. They also did not arrest her forcibly, but advised her to cooperate with the police. She eventually complied with the officers' instructions and was arrested for criminal intimidation. The woman was then sent to Sengkang General Hospital where a doctor said she did not sustain any injury. She was released on police bail on the same day. A 5½-minute video of the incident was uploaded to YouTube by user CoinPusher Love on Tuesday. The video, taken from the perspective of the neighbour whose apartment was being attacked, depicts the woman using a chopper to smash the glass windows. She is also heard shouting at the police and the people inside the apartment. A shorter version of the video was shared on the Facebook page of alternative news website All Singapore Stuff at about 4.20pm on Wednesday. It quickly became viral, amassing more than 1,000 comments and being shared more than 11,000 times in two hours.